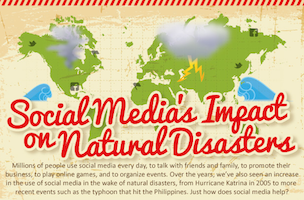 Social media has quickly proven itself to be a revolutionary tool for business – not to mention revolution itself – but platforms such as Twitter and Facebook have also become enormously important as sources of information during natural disasters and emergencies. Indeed, on a day-to-day basis many of us use social media to inform friends and family about our whereabouts and safety, while governments and official bodies around the world utilise these channels to keep the public informed during times of crisis, with examples in recent years including the Haiti earthquake, the Japanese tsunami and Hurricane Sandy. 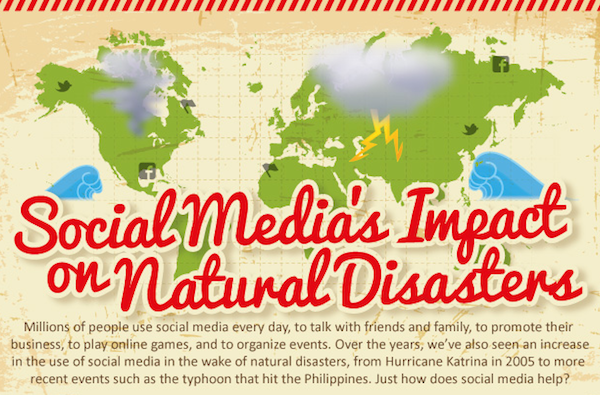 This visual from WhoIsHostingThis.com takes a closer look at social media’s impact on natural disasters.